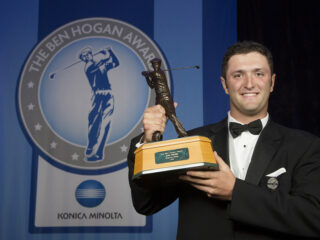 FORT WORTH, Texas – The Ben Hogan Award committee, in conjunction with the Golf Coaches Association of America (GCAA), has officially announced its schedule of announcements leading up to the presentation of the 2013 The Ben Hogan Award. The Ben Hogan Award watch list, which is typically comprised of approximately 25 individuals and kicks off the start of the spring college golf season, will be released on Wednesday, Jan. 30. Each individual on the watch list will be featured on www.TheBenHoganAward.org prior to the naming of the 10 semifinalists, a group that will be revealed on Thursday, April 18. The three finalists will then be announced on Wednesday, May 8. The trio of finalists will attend a black-tie banquet at Colonial Country Club on Monday, May 20, where the winner will be crowned. Just 12 of the 27 golfers who appeared on last year’s watch list are still collegians. Among them are five of last year’s 10 semifinalists–Julien Brun (TCU), Cheng-Tsung Pan (Washington), Patrick Rodgers (Stanford), Justin Thomas (Alabama) and Chris Williams (Washington). The Ben Hogan Award, the most prestigious award in college golf, recognizes the outstanding male amateur and collegiate golfer of the year taking into account all collegiate and amateur competitions during the past 12-month period. The Ben Hogan Award Selection Committee represents leaders in professional, amateur and collegiate golf. Winners of The Ben Hogan Award currently on the PGA TOUR include Mark Wilson, Hunter Mahan, Ricky Barnes, Bill Haas, Ryan Moore, Matt Every, Chris Kirk, Rickie Fowler and Kyle Stanley.